Erie has had a love affair with professional baseball since the 1880s, though it has been an on-again off-again relationship. Whatever they were called the Olympics, Blackbirds, Sailors, or SeaWolves the Flagship City s teams have thrilled fans and won championships. However, many of those local nines faded away, leaving behind memories and empty ballparks. Baseball in Erie is a tribute to the men who brought baseball to this region of Pennsylvania: ambidextrous pitcher Tony Mullane; infielder Louis Bierbauer, the original Pittsburgh Pirate; Sam the Jet Jethroe; Turkey Mike Donlin; Todd Zeile, the record-setting nomadic major-leaguer; and Jose Guillen, the first SeaWolves hero. Through photographs and memorabilia, Baseball in Erie reaches out to fans of the national pastime, especially those who were jammed into the rafters of Ainsworth Field and now bask in the beauty of Jerry Uht Park." Mark K. Vatavuk, a former associate team physician for the SeaWolves, is a member of the Society for American Baseball Research and a resident of Erie. 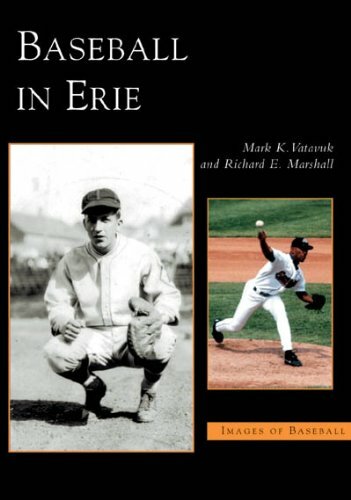 Richard E. Marshall, an Erie native, is a baseball historian and longtime minor-league fan.